Cambodia’s customs department counted less than 1 percent of the sand Singapore reported importing from Cambodia last year, according to trade statistics. The new data is the latest addition to a more than 77 million ton gap from 2007 to last year that the governments of both countries have attributed to differing international reporting standards, and activists have chalked up to corruption. Meanwhile, Cambodia has exported almost 100,000 tons of silica sand this year. The government says that type of sand is exempt from its October ban on exports of the commodity, according to trade data on the website of the Finance Ministry’s department of customs and excise. Singapore, which uses sand to reclaim land and expand its territory, reported importing more than 6.5 million tons of Cambodian sand last year in data it provided to the U.N. Commodity Trade Statistics Database—down from more than 10.9 million tons the year before. 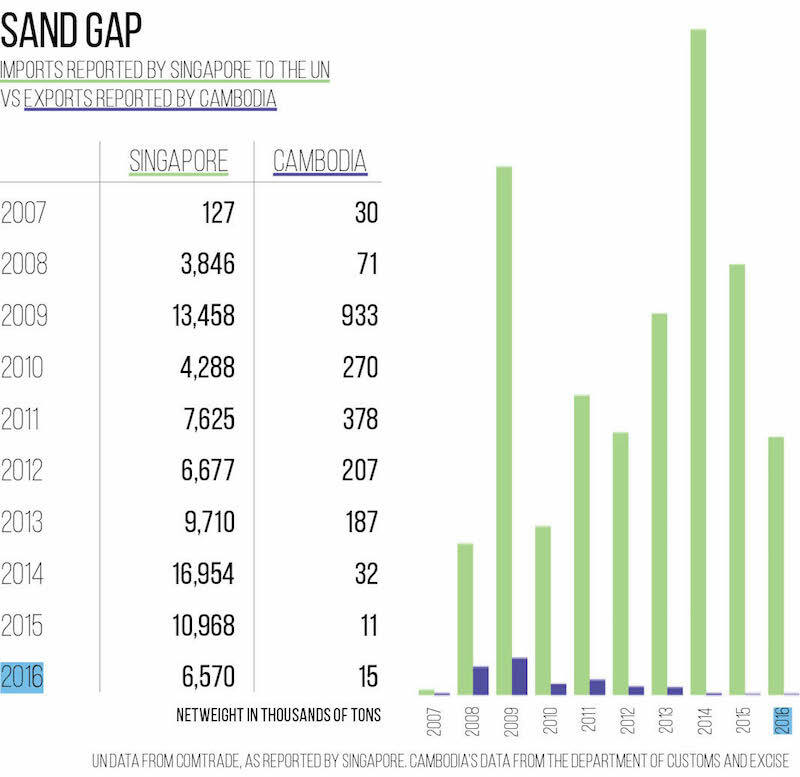 But Cambodia’s customs department figures show just 14,800 tons of Singapore-bound sand leaving the country, continuing a trend over the past three years of the department counting less than 1 percent of the sand recorded by Singapore. Meng Saktheara, a spokesman for the Mines and Energy Ministry, repeated the ministry’s past defenses of the gap, arguing that such discrepancies were a common feature of trade statistics due to international differences in measurement, classification and reporting. “Basically, you can’t find a country that has an exact match,” he said, adding that he was puzzled by why the gap might be so large. 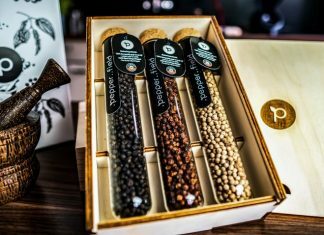 Singapore’s National Development Ministry did not respond to a request for comment, but in the past has blamed the trade differences on different calculation formulas. 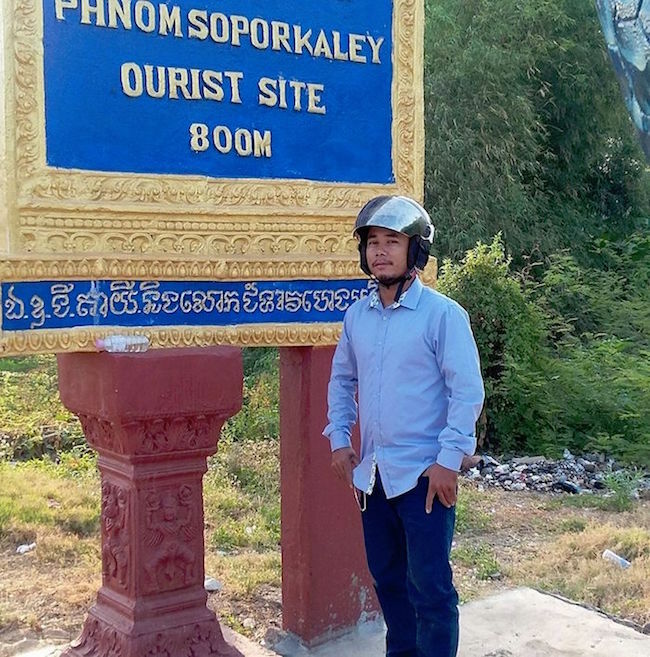 Those explanations do not satisfy Alex Gonzalez-Davidson, the exiled founder of environmental NGO Mother Nature, which has documented ecological havoc caused by what it calls illegal sand dredging in Koh Kong province. “The gap in reported trade, as the vast majority of Cambodians already know, is due to smuggling, under-reporting, and several fraudulent practices key government agencies have been engaged in over the last 10 years,” he wrote in a Facebook message on Monday. Although the ministry banned sand exports in late October to get to the bottom of the trade gap, Mr. Saktheara said it had immediately issued a clarification allowing the continued export of silica sand. Cambodia’s exports of silica sand, which is used to make glass, were sourced from the ground rather than waterways, according to Mr. Saktheara, with almost all of the exports coming from special economic zones (SEZs) along the coast. “The sand leaving Cambodia—if it’s legal—is all silica sand,” he said. Those exports have totaled 94,600 tons sent to China, Taiwan and Thailand, according to the customs department.